Scotland has 284 Munros to climb. All these mountains are over 3000 feet high. The Isle of Skye has 12 Munros. 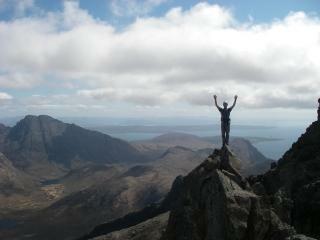 11 of these are on the Cuillin Ridge. These are some of the most difficult Munros to do. Most of them require some scrambling skills. The hardest of these is the true summit of Sgurr Dearg, the Inaccessible Pinnacle, which must be climbed by a Moderate rock climb. If you are a walker with little or no experience of scrambling then we at Alpha Mountaineering can guide you to success on the Skye Munros. We will provide all the equipment, instruction and experience you will need to gain these technical summits on the Skye ridge. Perhaps you are also aiming to do all the Tops as well as the Munros. Munro Tops are subsidiary summits to Munros which although they meet the height criterion for a Munro they are not deemed to be separate Munros. There are 227 Tops. If you are a 'Tops Bagger' you will have to summit Knight's Peak and the Bhasteir tooth. We can create a course to suit you and your aims. 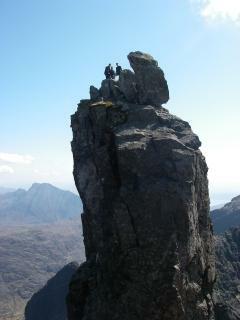 The best time to book an Alpha Mountaineering guide for the Skye Munros is April, May, June, September or October.